An amber bead. A gold and glass drinking horn. A ring engraved with Thor’s hammer – all artifacts from a Germanic tribe that carved a space for itself through brutality and violence on a windswept land. Winner of the Words on Wings Book Award for young adult fiction, a Literary Classics Top Honors Award. Finalist for Finalist for the 2014-2015 Sarton Literary Award for Historical Fiction and Finalist for Foreward Reviews’ 2015 Indiefab Book of the Year Award: Historical (Adult Fiction). Recipient of Literary Classics Seal of Approval. Brimhild weaves peace and conveys culture to the kingdom, until the secret of her birth threatens to tear apart the fragile political stability. This is her story – the tale of Grendel’s Mother. She is no monster as portrayed in the Old English epic, Beowulf. We learn her side of the story and that of her defamed child. We see the many passages of her life: the brine-baby who floated mysteriously to shore; the hall-queen presiding over the triumphant building of the golden hall Heorot and victim of sexual and political betrayal; the exiled mere-wife, who ekes out a marginal life by an uncanny bog as a healer and contends with the menacing Beowulf; and the seer, who prophesizes what will occur to her adopted people. We learn how the invasion by brutal men is not a fairy tale, but a disaster doomed to cycle relentlessly through human history. Only the surviving women can sing poignant laments, preserve a glittering culture, and provide hope for the future. For those who know Beowulf well, many allusions in my book will be familiar to them. For those who have not yet read the Old English work, in the original or translation, my book is self-standing. My hope is that more people will read and love Beowulf and other works written in Old English. 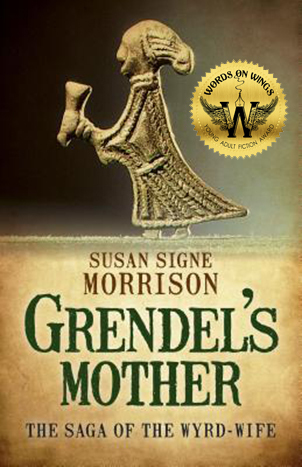 Grendel’s Mother has been chosen among 100 Must-Read Medieval Historical Fiction Novels by Book Riot. A welcome glass of champagne with the medal and award. Wily word weaver! Thank you. This is a sterling and spritely story.